Another band that deserved much more consideration than they got, Murple released a lonely beautiful album in 1974 on the german Basf label, one of very few italian releases on this label, that didn't cared to promote the group at all. It's a shame, because Io sono Murple is a very regarding album, well presented in a fantasy cover and with lyric insert, and very well played by this four-piece from Rome. The album contains a long suite divided on the two sides, based on the story of a penguin ,and even if the lyrics are somehow naive, the music is very good, with classical inspirations especially in the keyboard playing and nice guitar parts. 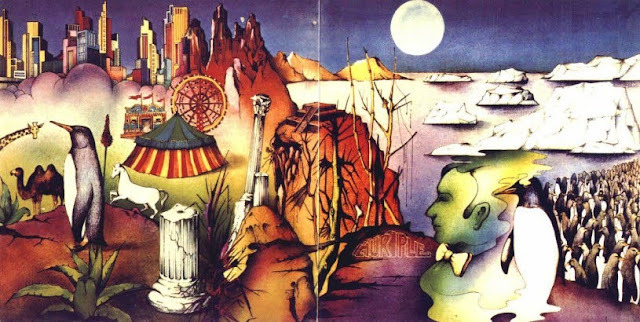 The LP was not successful, obviously, and the band collaborated with some other artists, like singer Gianfranca Montedoro (previously in Living Music) on her Donna circo 1975 album, but though they were ready to record a second album, decided to split.